Dates for year 4 of our amazing sports climbing holidays are out! This year once again Margalef will be headlining our coaching holidays from 7th April to 12th April 2019. Our 6 day sports climbing holiday heads to the pocketed paradise of Margalef, Spain. 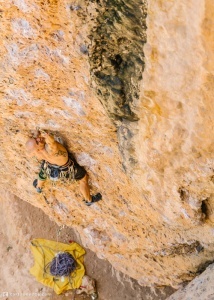 Just 2 hours drive from Barcelona and surrounded by some of Europe’s best climbing. The trips aims to cater for climbers of all grades, from those looking for there first sports climbing holiday to those looking to push there grade into the 7’s. With expert coaching helping you with the technique and tactics to make the most of your trip. The 6 day trip involves 5 days of sports climbing. In Margalef this constitutes 4 days in Margalef and a day at another local area to sample a different style of climbing. Each day involves detailed coaching, breaking down your movement on the rock, including tactics and psychology of sports climbing. As well as Warming-up and route reading, post climb recovery and training advice. Please contact us if you’d like help training and preparing for the trip. Sunday 7th April 2019 to Friday 12th April 2018 (proposed arrival on Saturday 6th April and departure either Friday 12th evening or Saturday 13th). Coaching, lots of coaching on technique, showing you how to move on the rock. Tactics, both how to read the rock, identify key sequences as well as pacing, resting and preparing for each route., Expect to take away everything you need to know be comfortable climbing outside and start pushing your grade and taking your climbing in what ever direction you want. Ropes, quickdraw provides, helmets and other personal protective equipment can be provided on request. Flights, accommodation (we will help you find the best place possible), food and travel. Personal Protective Equipment: Helmet, Harnesses, belay devices, rock shoes, chalk. Accommodation and Food. Margalef as a number of cheap and nice restaurants and bars to eat at each evening and a small shop to buy provisions from. There are also a number of other pleasant bars and restaurants in neighbouring villages. Margalef has everything accommodation wise from cheap and cheerful to nice private rooms and apartments to rent. We recommend the following places to stay. Margalef is 2 hours from Barcelona, the first 80 minutes on motorway, then the remaining 40minutes on wiggly mountain road, but made up for my the spectacular scenery. Is a performance climbing coach working across London and the South East, he regularly coaches climbers up to International Level and up to 8b on rock. With over 15 years experience of rock climbing and a strong sports climber he has a strong academic background in Sports Science, is a level 4 Strength & Conditioning Coach, and excels in perfecting climbing movement and improvement through technique, tactics and training.